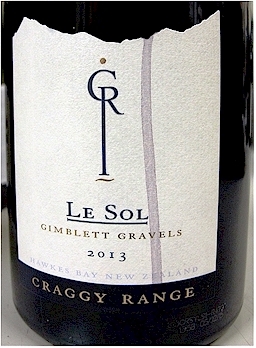 It’s many years since I tasted the iconic Craggy Range Le Sol Syrah from Hawkes Bay but the 2013 vintage crossed my lips at the First Glass wine tasting in February and what an enchanter. I looked. I sniffed. I sipped, I savoured. This fairytale prince in a flowing velvet wine cape had me spellbound. The deep purple hue is almost lustrous in the glass, the bouquet is rich, dense and meaty with a delightful black cherry sweetness and it’s phenomenally smooth and silky in the palate with juicy ripe fruit balanced by the savouriness of the oak and the firmness of the melt-in-the-mouth tannins. Not overtly peppery, but there’s a tantalising whisper of spice with a touch of anise and a lick of chocolate on the fabulously long finish – with lots, lots more as the wine evolved. All in all a pleasure to taste and savour. I really like this and while it is made to age it seems eminently drinkable already. At $100 a bottle it’s a little above (errrr, a lot above) what I like to pay, but when consider I could get eight of these and change for one bottle of Grange, if I was young and collecting wine, this would be an investment I would want to make. So I’ve admitted to a few people I am not a passionate fan of NZ Syrah and the reason why is that the wines are so variable, in fact some are overtly green pepper and herbal and lack generosity to me. But if I only ever drank the top tier wines, the likes of Craggy Range Le Sol, Trinity Hill Homage and Passage Rock Reserve, I would never ever be complaining. Try it if you get the opportunity and you’ll see. This entry was posted in #nzwine, hawkes bay, shiraz syrah by Sue Courtney. Bookmark the permalink.